An entire series dedicated to the two-handed caster. There are three Prospector spey models that will appeal to salmon and steelhead anglers who need to make long casts with big flies all day long. With a medium-fast action, the rods have enough power to cast the heaviest of tips and flies necessary to get into the zone of winter-run fish. Trout anglers will be pleasantly surprised with the fish-ability of the lighter switch models and their ability to cast streamers with two hands or heavy nymph rigs single-handed. 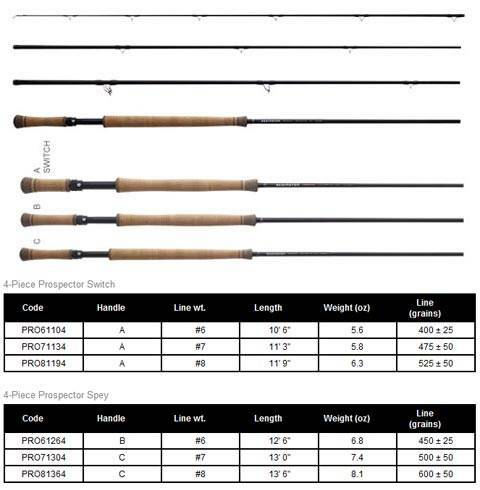 The longer switch models offer the same versatility for salmon anglers who enjoy the benefits of both single and double-handed casting.